You are here: Home » It’s Here! It’s Here! It’s Here! After nearly a year and a half of planning, designing, meetings, starts and stops, it’s finally here! It isn’t a secret that I LOVE postcards. I collect them and I send them out to people regularly. I often even send them to people when I’m not on the road. I’m always keeping an eye out for postcards that catch my eye, and to add to my collection. I also know that sending post cards is a dying art. It’s strange. 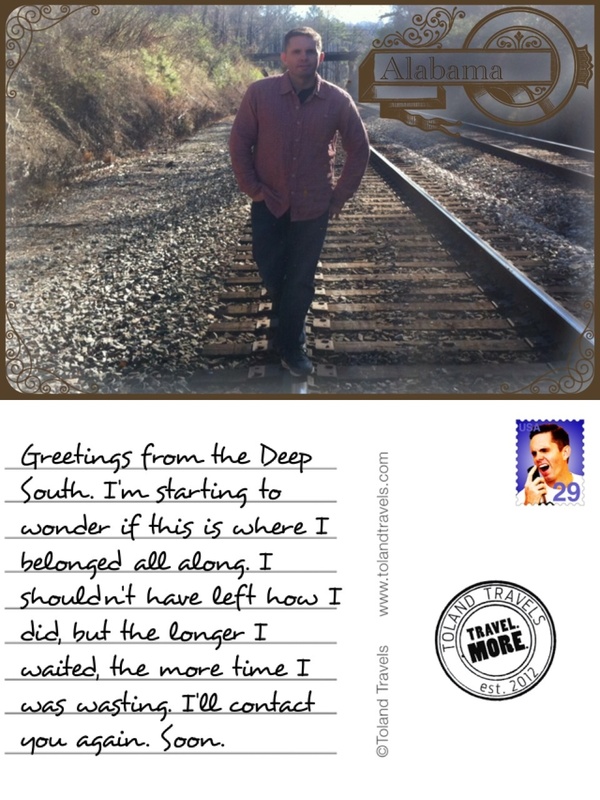 People love getting postcards, but fewer and fewer people send them. There a few reasons for this, obviously. 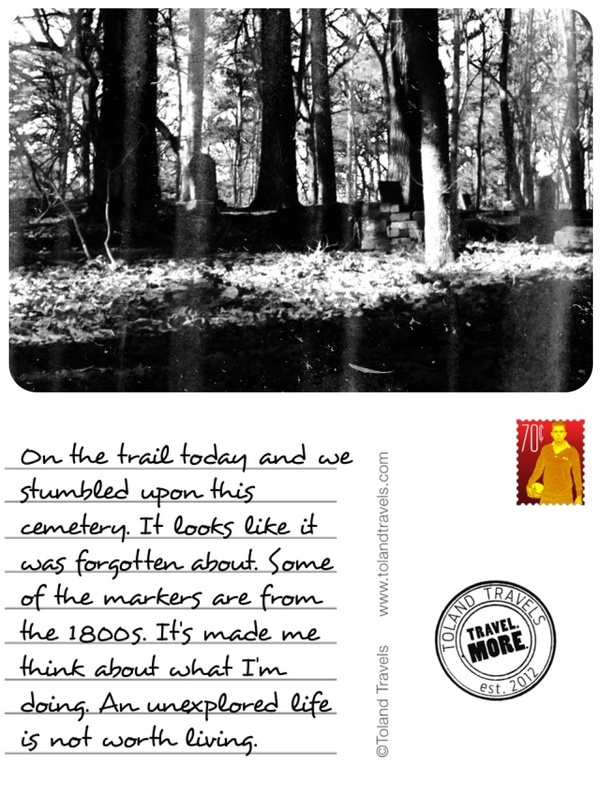 It’s hard to find stamps when you’re on the road, and sometimes people don’t know exactly what to write, sometimes there just isn’t time to peruse the postcard displays, and some even find the idea of taking pen to paper a bit taxing. Fear not! I’m here to help. I’ve come up with a quick and easy way for you to put together your own postcard, but I think it’s better than all the other digital options out there because it’s completely customizable by YOU! 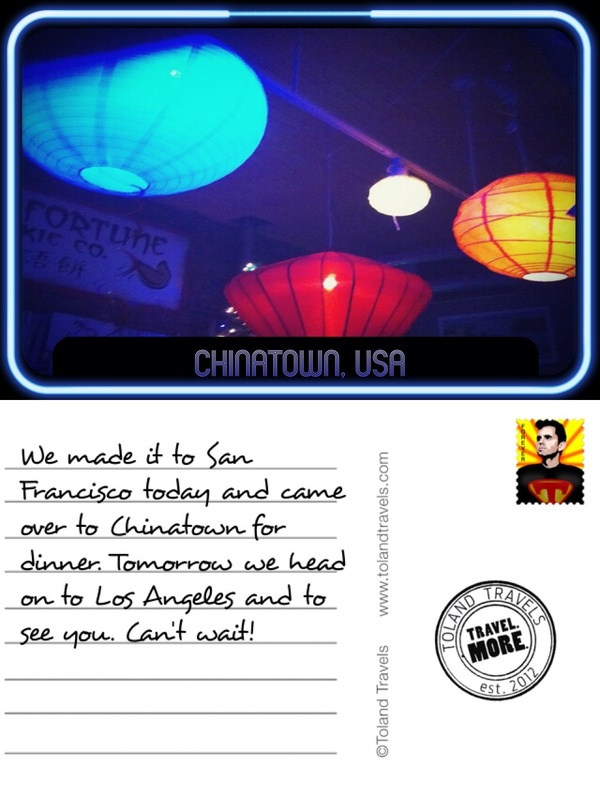 The app allows you to create your own postcard with one of five templates that come standard. Each is completely different in its style, and yet they are each perfect for a variety of different settings and types of cards. I designed the app to be easy to use and versatile. The process starts with you either taking a photo or using a photo already in your library, using either of the button at the bottom of the page. The button on the left accesses your photo library. The right button turns on your camera to take a picture. 1. If you are taking a picture, turn your camera on its side to optimize your use of the photograph space. The photo works best when it will be a horizontal rectangle, like an actual postcard. 2. If you’d like to edit the photo before you start the postcard process, it only adds to the more personalized nature of the postcard. 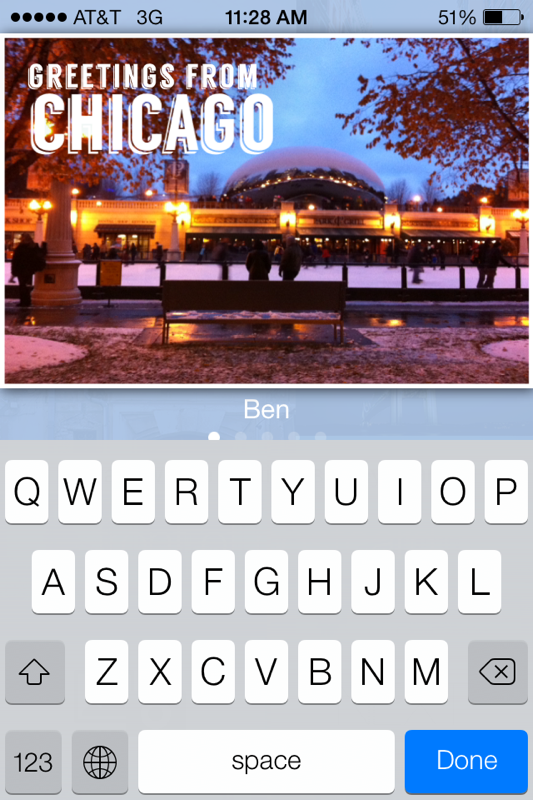 You can use the editing tools that are built into the iPhone camera or even Photoshop. Other apps such as “Over” and ‘VSCOcam” are also worth exploring. 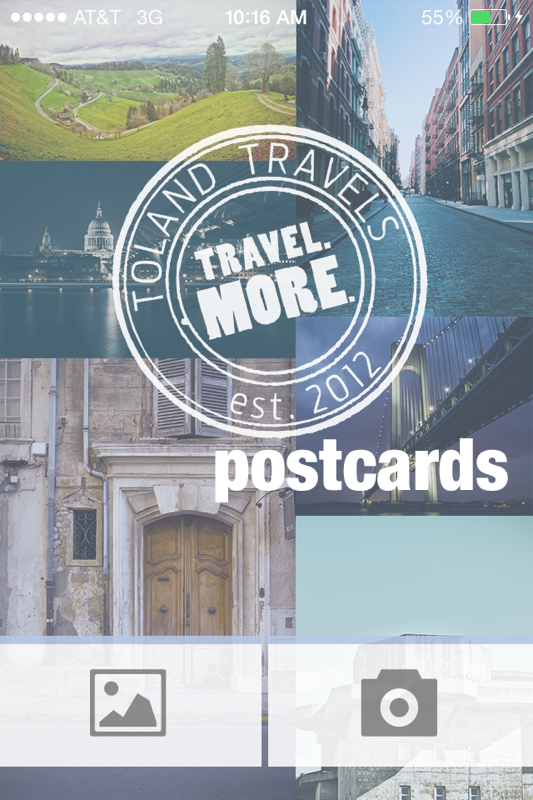 When you have created the photo you like, save it to your phone, then open Toland Travels Postcards, and use your new creation. The next step is to create the visual (top) of the postcard. 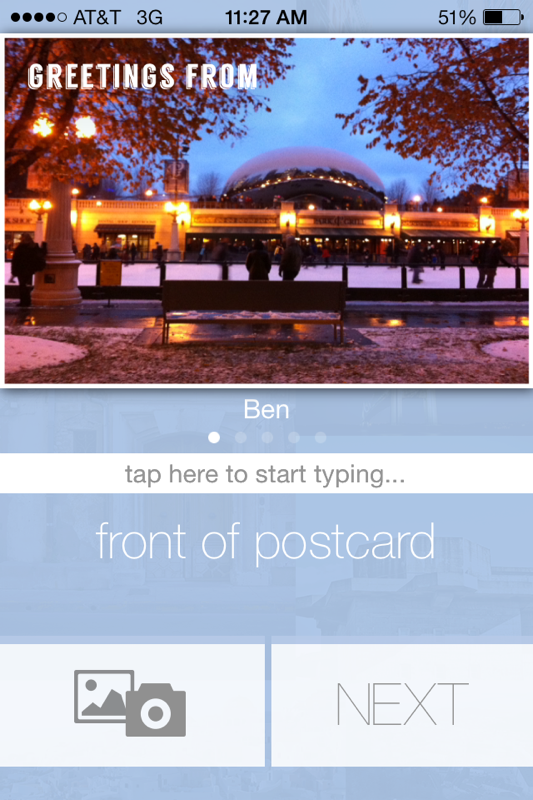 Once you have selected your picture it will automatically be loaded into the “Ben” postcard style. 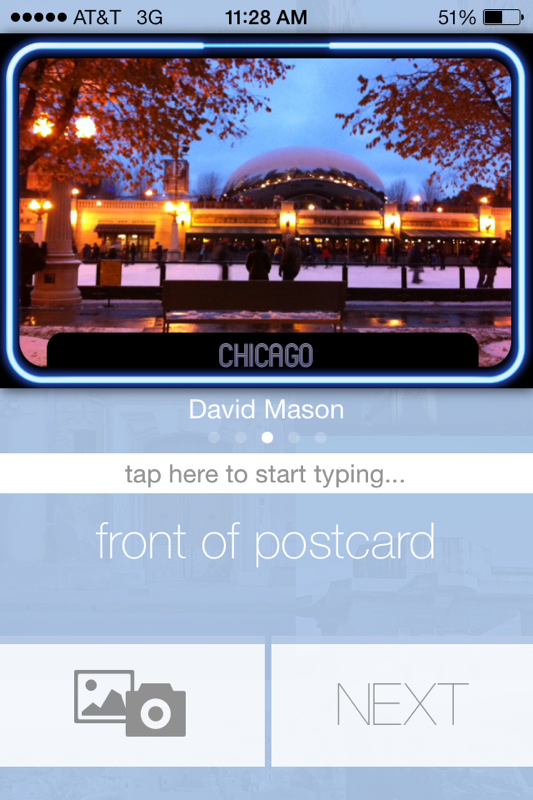 If you want to change the postcard, simply swipe left or right. The picture won’t change, but the postcard style will. Next, tap the white line running across the center of the screen. The keyboard will pop up and you can add your message. Some postcards come preset with “Greetings From” already fixed, but others are more open ended. As you type, the letter size and spacing adjusts automatically to accommodate longer words and phrases. Tap the screen again and the keyboard will slide down. At this point you can either press the “Next” button, or swipe through the postcards. The text that you entered will remain, but will be formated for each card. 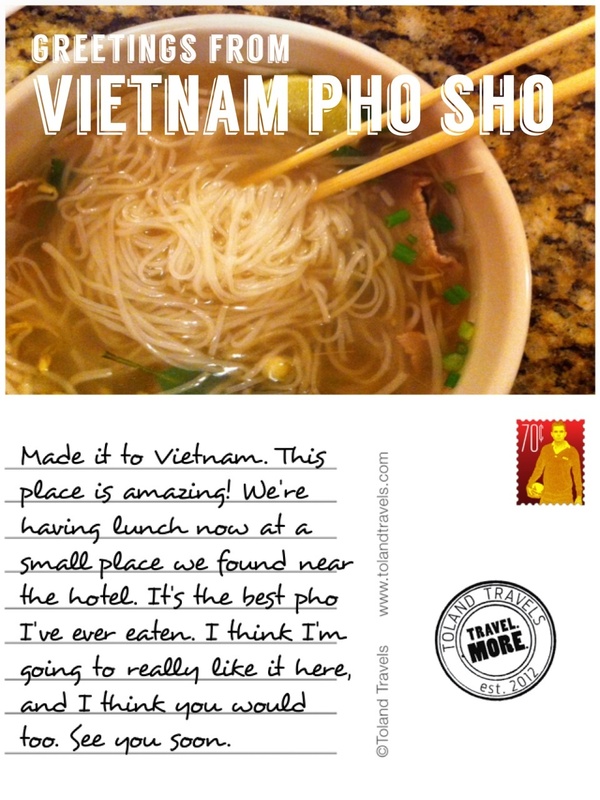 If you push the “NEXT” button, you will see the message portion of your post card. Tap the screen, and the keyboard will pop up. Type your message. If you are at a lost on what to type for that perfect postcard message, here’s a handy guide. When you’ve crafted the perfect message, tap the card and the keyboard will slide down. 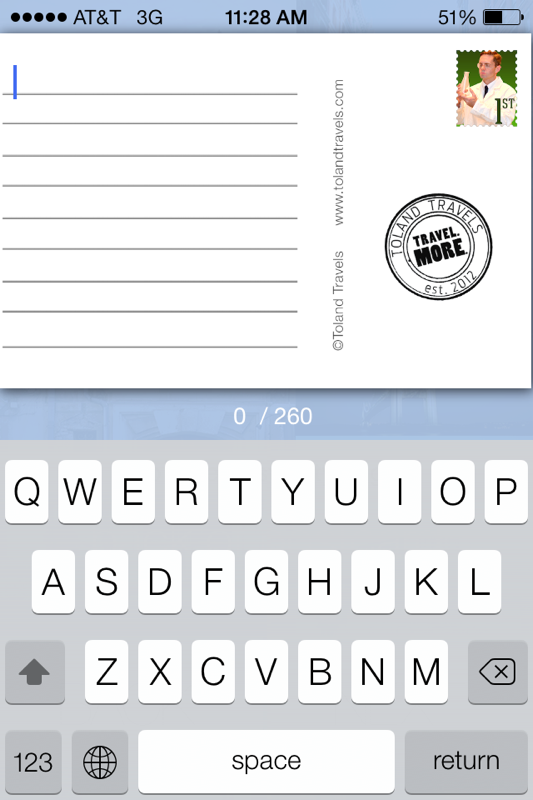 Finally, to access your postcard, click the bottom right button, and it will automatically be saved to your phone. You will receive a notification of it being successfully saved to your library. Now you can text it, email it, or upload it to Twitter, Instagram, Facebook, or any other social media. You can also print it off and mail it if you like! It’s easy to use, and because of its customizable aspects, much more personal and meaningful to you and the recipient. I hope that you like the app, and that it’s useful to you, no matter what your adventure may be. 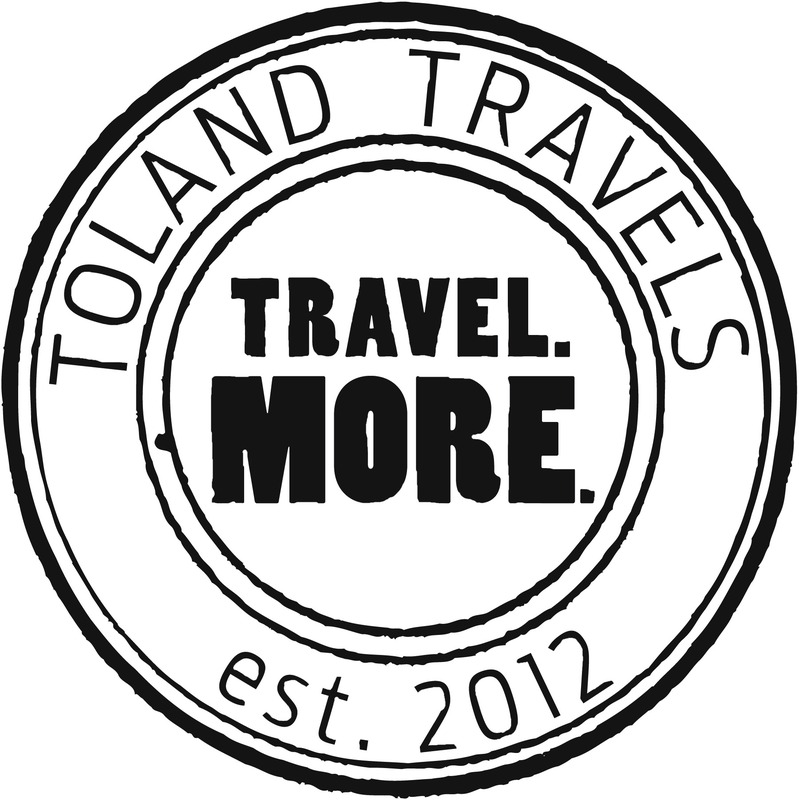 Follow Toland Travels on Instagram #tolandtravels, and on Twitter @tolandtravels. Like Toland Travels on Facebook.